In prior systems the driver’s steering inputs were communicated mechanically first. 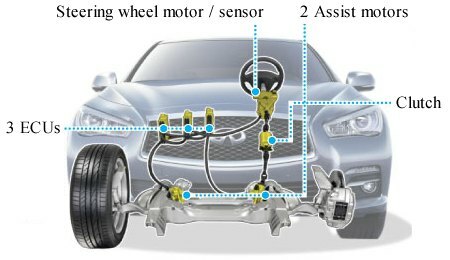 Then the Direct Adaptive Steering system utilizes electronic signals and transmits the driver’s steer inputs faster than a mechanical system. At the same time, the system communicates information from the road surface to the driver in a way that is faster and easier to understand. The system actually communicates with the driver’s steering inputs to the Electronic Control Unit (ECU). The ECU then converts the information to control signals for the Steering Angle Actuator, adjusting the cutting angle of the front tires which records the data . The road information, such as the force on the tires, is simultaneously communicated from the Steering Angle Actuator to the ECU, which then screens it and returns only the information necessary for driving back to the steering wheel.